The 3 Sprouts storage box is the perfect organizational tool for any room. With sides reinforced with cardboard, our storage box stands at attention at all times. Made to fit almost all cubby hole shelving units, it adds a pop of fun to every room. Whether standing alone or placed in a cubby hole, the 3 Sprouts storage box makes organizing easy. 3 Sprouts was created by three friends who share a love of babies and an appreciation for unique and modern products. Having worked in design in New York and Toronto for such high profile companies such as Kate Spade, Barneys New York and Holt Renfrew, the 3 creators were inspired to create a collection that appealed to both parents and children. Since the birth of 3 Sprouts in Spring 2007, 3 Sprouts has been fortunate to serve customers who share a commitment for well-designed baby and children’s products. These creators love what they do at 3 Sprouts and find great joy in designing products that fit seamlessly into your life and leave you with a smile. 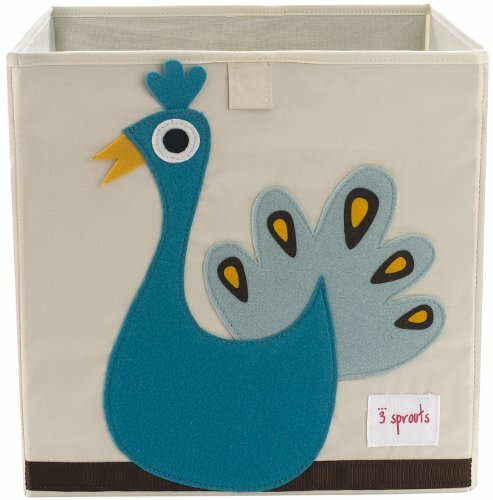 3 SPROUTS: Keep items grouped together with the 3 Sprouts Storage Box. With sides reinforced with cardboard, the storage box is collapsible and is perfect for any kids room, playroom, nursery, or closet. DESIGN & STORAGE: Made of a cloth canvas with fun felt animal characters on the front, the box fits in most shelving units and cubbies and is great for baby shower gifts, toys, books, clothes, games, supplies, and art & crafts. FOLDABLE ORGANIZERS: Easy to assemble and store when not in use. The sides come down to fold flat and pop back up when needed. Sturdy enough to stand alone on shelves, bookcases, and desks. TABS FOR PULL OUT: Handy tab on the front makes it easy for both kids and adults to pull it off shelves and push back into the cubby hole units. MATERIAL & DIMENSIONS: Made of 100% polyester with dimensions of 13" x 13" x 13" For cleaning, spot clean with water. Each unit is sold separately and includes one box. If you have any questions about this product by 3 Sprouts, contact us by completing and submitting the form below. If you are looking for a specif part number, please include it with your message. IvyH Large Toy Hammock - Stuffed Animals And Kids Toy Organizer Storage Net Hanging Corner Wall,Easy To Install,55"x35"x35"